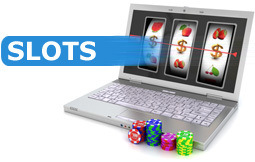 Online slots with a Food theme. 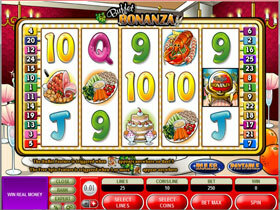 Play slots that feature food of all kinds. Read our review of Buffet Bonanza Slot, Harveys Slot, Royal Feast Slot, Cash n Curry Slot, Cream of the Crop, and a New RTG Slot called Jumping Beans Slot. Buffet Bonanza is based on the theme of a delicious buffet with roasts, desserts and pastries that will have your mouth watering. There are more than 27 winning combinations with various winning icons. The Diner icon is the Wild, the Buffet Bonanza icon is the Scatter and the Fruit Platter icon is the jackpot icon. Having 5 Fruit Platters show up on any active pay line will reward you with the top jackpot of 6,000 coins. Other paying icons in this slot include the Cake, Fried Fish, Salad Plate and the numbers and high valued symbols of playing cards. The game has a combination of attractive graphics, bonus features and sound effects to keep you truly entertained for hours. 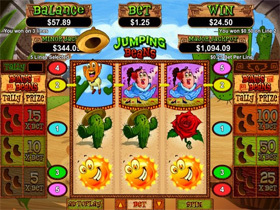 Jumping Beans is now live and is one of the Newest RTG Slot games.. 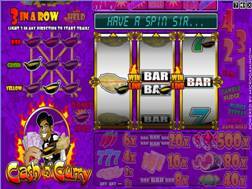 This 5 reel slot will have you jumping around in excitement with icons depicting characters such as the energetic bouncing Mr Bean and the dancing Mrs Bean. Put on your sombrero and be prepared to party with great features such as the "Auto Nudge", whereby any Bean icon that land off-screen will automatically be nudged back into the reels after initial winnings have been paid out. Plus, the more Beans you collect during the Free games feature, the closer you will be bouncing towards enticing Bonus prizes totalling of up to 100x your bet. 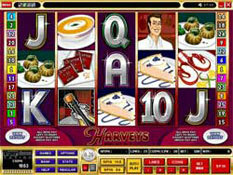 Harveys is a microgaming slot game with a restaurant theme. Mr Harvey is the restaurant owner and is also the wild symbol . If the Popping Champagne corks appears on reel s 2 and 4 at the same time - then the free spins bonus feature will be activated where you can get between 6 – 30 free spins. During the free spins, each win will be multiplied by the Mystery Multiplier up to as much as 25 times. No feast is complete without a second helping. 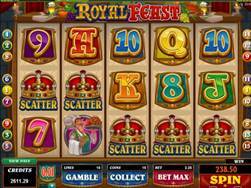 Royal Feast is a 5-reel, 15-payline slot from microgaming. This slot will make you feel like royalty as you dine with the king and his loyal subjects. With Wild and Scatter features, free spins and a gamble feature, Royal Feast is a medieval feast with all the trimmings. 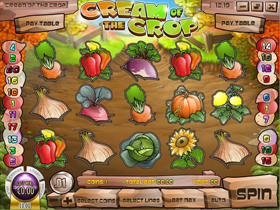 Cream of the Crop Rival Gaming Slot opens up with a movie introduction featuring an agriculture scene and little animals. It has 5 reels and 20 pay lines with an Expanding Wild Bonus Feature. Instead of the reels spinning, seeds drop onto the ground and start to grow, revealing the icons. Icons include a Sunflower, a Pumpkin, Sweet Corn, Peppers, a Lettuce, a Carrot, a Radish, an Onion and a Weed. First time players will find Cash n Curry Slot a lot more challenging than normal but you are encouraged to persevere and reap the rewards of this exciting game. As expected it has an Indian theme and you are to line up Indian style sauces by using the Gamble Nudge, Hold and Nudge Repeat to make your way to the super jackpot trail or further onto the Curry Go Round. This bonus feature can reward you with up to the top payout of 20000 credits. Use the Nudge option to line up your curry icons for the opportunity to go up to an 80 multiplier. This is hot curry and will definitely leave you flavourful for another helping.